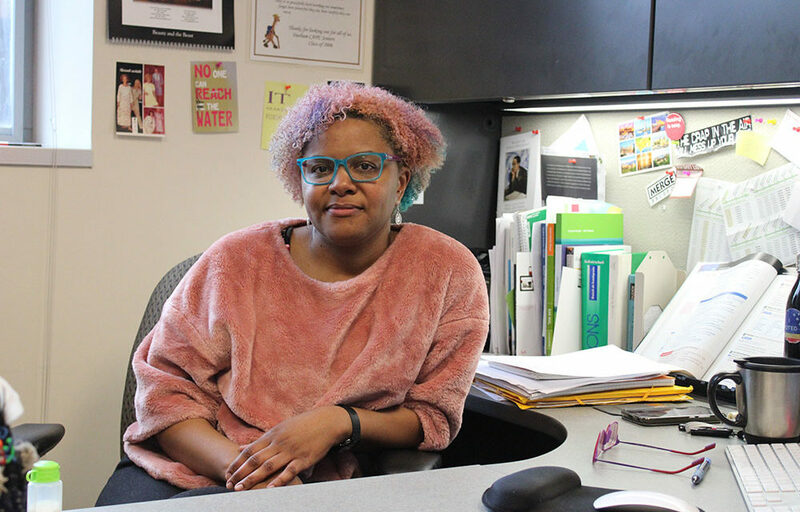 Michelle Eley, an assistant professor in the department of foreign languages and literatures, sits at her desk in Withers on Wednesday, March 20. Eley teaches German to students at NC State. Over the years, she has lived in various parts of Germany, including Berlin and Essen. That’s how assistant professor Michelle Eley responds when strangers ask, “What do you do?” But those three words are a vast oversimplification of the complexity Eley’s work brings to German studies. Eley is an assistant professor in the Department of Foreign Languages and Literatures who teaches courses in German and film studies. She studies how the linguistics of films reveal cultural understandings of national identity, race, ethnicity and gender. Eley’s interest in Germany began in high school after meeting a German exchange student. After graduating, Eley picked up some German while visiting his family. She entered college with the intention of attending medical school and took German courses on the side. Eley was also a philosophy nerd. She recalls this being the “final hook,” as she was both blown away and frustrated by modern German philosophers. This made her want to study the language in depth. In the 1980s, Hügel-Marshall and Ayim were part of a group of women influenced by and in conversation with Audre Lorde. This group coined the term “Afro-Deutsche,” which translates as “Afro-German.” According to Eley, these women were connecting themselves to an African diaspora identity. This term provided the language for many black people in Germany to describe their unique experiences and history. Language had been, and continues to be, a challenge in black German studies. Germany’s history of colonialism and Nazism give the word “race” a very different connotation than the English word. Thus, Eley said, this word isn’t used the same way. In some cases, English becomes the communal language. In other cases, Afro-Germans create new ways to describe their experiences. Eley’s current work focuses on the pedagogy of including diversity in a foreign language context.